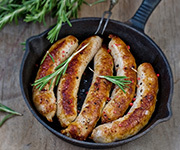 Combine zesty Organic Prairie Italian sausage links with fresh-from-the-source organic vegetables for the perfectly tasty but un-fussy meal you can prepare in a jiffy. Vary the ingredients to suit your tastes or what is in your garden. Zucchini chunks, thin-sliced potatoes, Chinese eggplant rounds, or any number of vegetables and herbs could substitute for the ones here. 1. Pre-heat your oven to 375 degrees. Oil the bottom and edges of a baking pan. 2. Halve or quarter the mushrooms (or leave them whole if they’re small). Cut the onions into sixths or eighths. Cut out core of the fennel and thinly slice the bulb. Place mushrooms, onions and fennel parts in pan. 3. Add tomatoes, garlic, olive oil, vinegar and rosemary and toss until veggies are coated with oil and vinegar. 4. Brown the Italian sausage in a skillet. You don't need to cook them completely at this point, just give them a good, quick coloring on the outside. Cut the browned links into chunks and submerge them in the vegetables. 5. Bake the mixture 30 to 40 minutes, stirring once during the bake time. Add salt and pepper to taste. Serve with bread to sop up the pan juices.